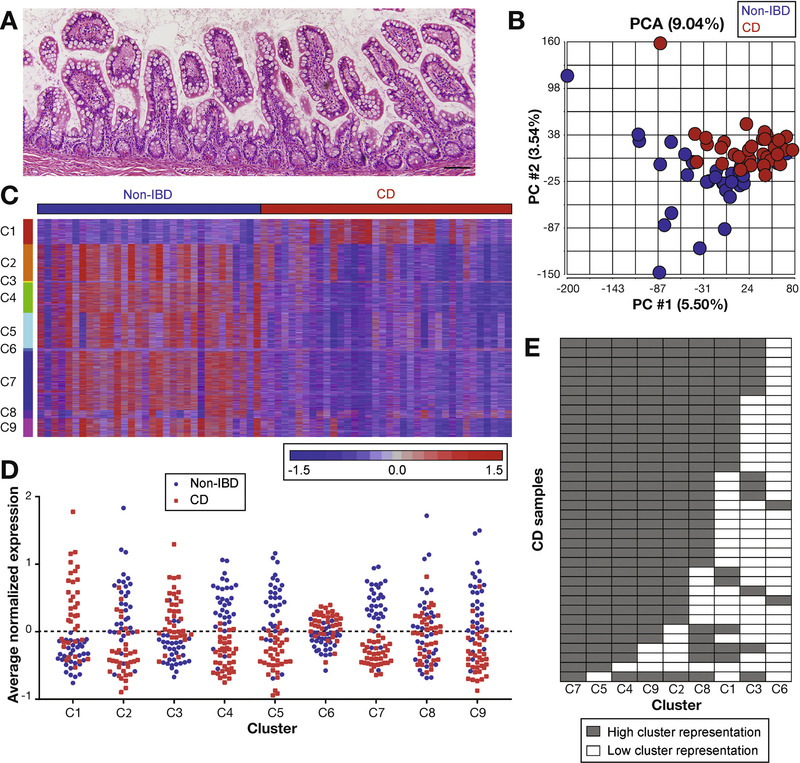 In an analysis of intestinal tissues from patients with Crohn’s disease (CD), researchers identified specific changes in gene expression patterns that associate with histologic changes, such as differences in microvilli length. Decreased microvilli length, via decreased expression of the microvilli gene set, might contribute to epithelial malfunction and the chronic and progressive disease course in patients with CD. Decreased expression of genes related to microvilli formation in intestinal tissues from patients with CD. (A) Intestinal microvilli structure showing the F-actin bundling components (1; purple rods), membrane-cytoskeleton crosslinking (2; blue ovals), and inter-microvillar adhesion complex (3; green rectangles). (B) Graphs of gene expression levels, displayed as counts per million (cpm) for the indicated microvilli component genes. The same data are displayed side by side as scatterplots and box-and-whiskers plots for CD (red) and non-IBD (blue) samples. **P<.01, ***P<.001, ****P<.0001. In the September issue of Gastroenterology, Kelli L. VanDussen et al examined uninflamed regions of intestinal tissues from patients with CD to identify defects that might contribute to pathogenesis and chronicity of inflammatory bowel diseases. They compared RNA sequences from formalin-fixed paraffin-embedded ileal tissue sections of 36 patients with CD and 32 individuals without CD. The authors explain that they chose resection samples because these contain whole-thickness tissue, including the muscularis propria, so all intestinal cells could be examined (in contrast to biopsy samples). For gene expression analysis, they selected samples with low levels of inflammation, based on histology, to minimize detection of signatures associated with altered proportions of cell subsets and instead identify small-magnitude gene expression changes in epithelial cells. A separate set of samples (3 control and 4 CD samples) was analyzed by transmission electron microscopy. 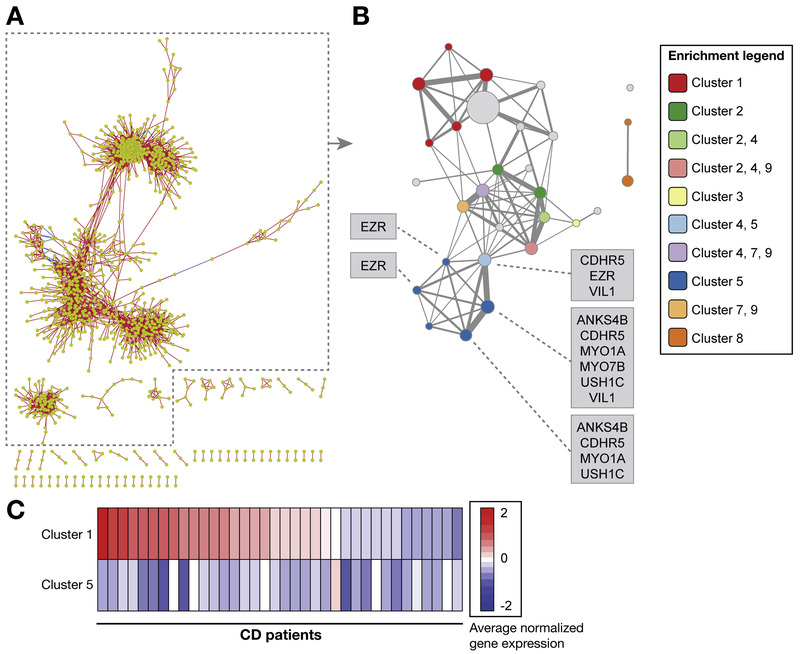 VanDussen et al then developed methods to visualize an overlapping modular network of genes dysregulated in the samples and validated their findings using biopsy samples from the UNITI-2 phase 3 trial of ustekinumab for patients with CD and healthy individuals. The authors identified clusters of genes with altered expression in nearly all CD samples. One cluster encoded genes associated with the enterocyte brush border, leading them to investigate microvilli. In ileal tissues from patients with CD, the microvilli were of decreased length and had ultrastructural defects compared with tissues from controls. 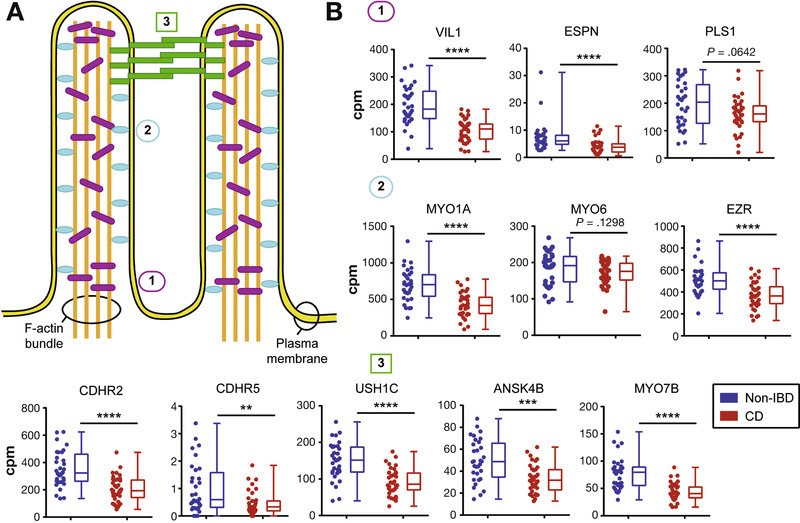 Microvilli length correlated with expression of genes that regulate microvilli structure and function (see figure). Network analysis linked the microvilli cluster to several other down-regulated clusters associated with altered intracellular trafficking and cellular metabolism. 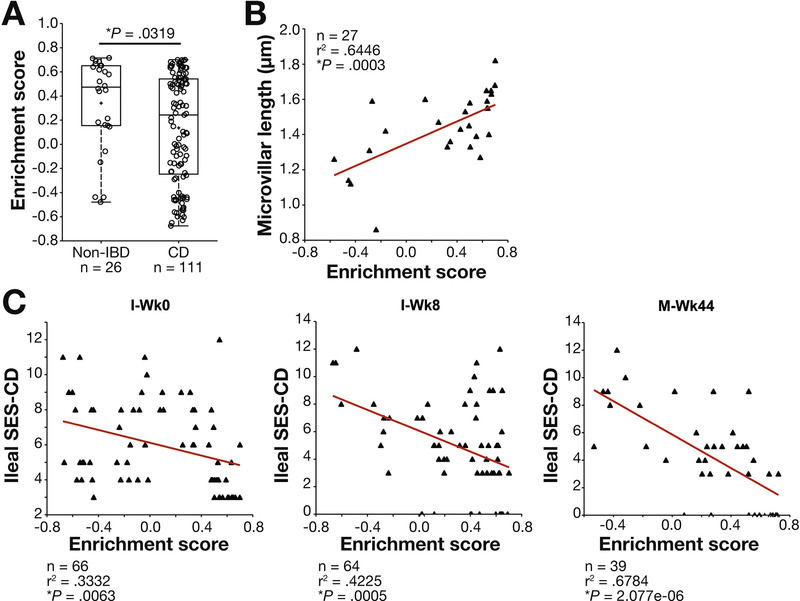 Enrichment of the core microvilli gene set also was lower in the validation set of CD samples compared with controls. 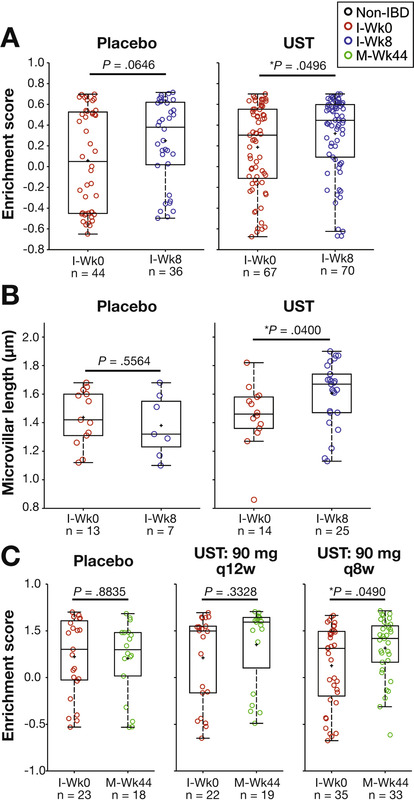 In these samples, expression of microvilli genes correlated with microvilli length and endoscopy score and was also associated with response to treatment with ustekinumab. VanDussen et al conclude that there are persistent alterations of intestinal cells in relatively uninflamed regions in patients with CD. Other studies have shown that microvilli length and stability are required forintestinal homeostasis. 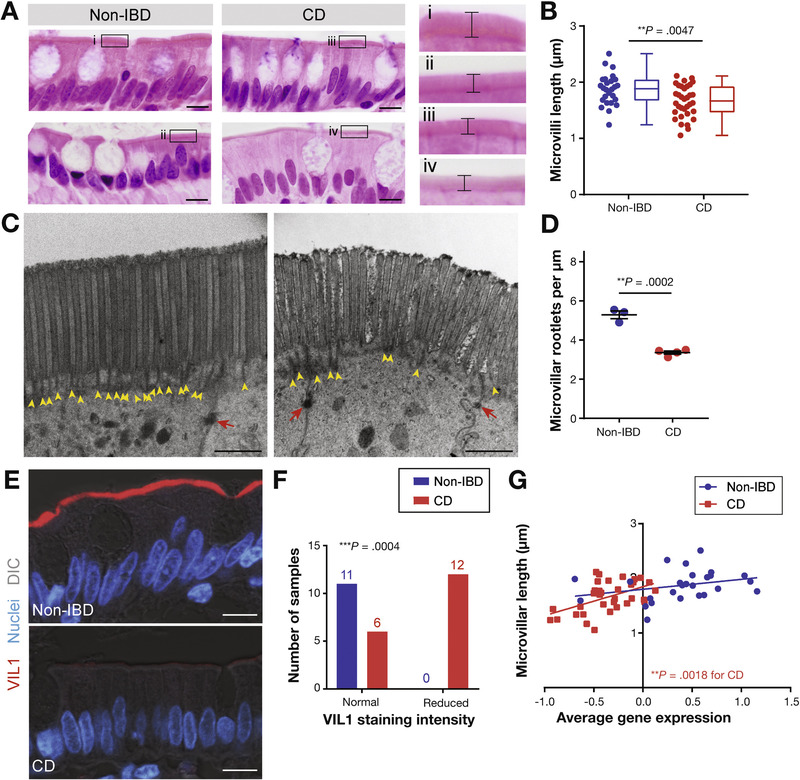 Microvillus inclusion disease, caused by mutations in MYO5B and STX3 genes, is characterized by patchy loss of microvilli and is associated with persistent diarrhea. In this study, expression of PLS1, MYO5B, STX3, and USH1C were reduced in intestinal tissues from patients with CD compared with controls. A similar, although more extreme, phenotype was observed in mice with disruption of Pls1, which had a 20% decrease in microvilli length and lacked microvilli rootlets. Further studies of the epithelial microvilli are needed to determine how defects in these structures might contribute to the chronic and relapsing nature CD.